Coney Island photographers Eric Kowalsky and Bruce Handy have been documenting the demolition for the past two days. They’re made of strong stuff. We’ve put off posting the images because it was painful to see this 87-year-old building having holes– first two and three, and now eleven– punched through its walls. We know a building is not a human being, but this is torture. The building looks as if it faced a firing squad and is a dead man standing. 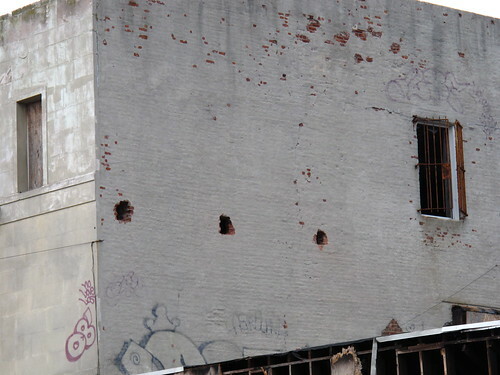 A poster on the Coney Island board claims that the holes are for shoring up the upper part of brick wall while they build the scaffolding from the inside, so as not to disturb what’s left of the fire-damaged arcade next door. But the bank building was built to last and isn’t going to come down easily. On the first and second day of Joe Sitt’s 40 Days of Demolition, the worst is yet to come. 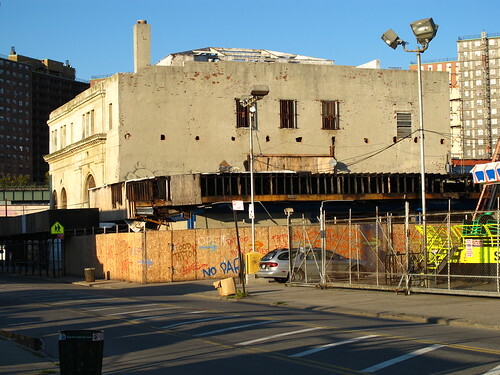 ATZ promised to live-tweet the demo to keep Sitt’s ongoing desecration of Coney Island in the public eye. But we have no idea how we’re going to weather the ordeal if the first two holes in a wall look like wounds to us. If we could have picked one building to save, the Bank of Coney Island would have been the one. For more info, read “A Rare Peek Inside Endangered Old Bank of Coney Island,” (ATZ, October 9, 2009).